Omar Husain is pictured with Judge Paul Gurney and Arleen Schuman, Judge Paul Gurney’s Administrative Assistant. To say that Omar Husain is “busy” is an understatement. Husain is a KU Law Student Ambassador, vice president of the Student Intellectual Property Law Association, secretary of the Environmental Law Society, a research assistant for Professor Andrew Torrance and a student representative for the American Bar Association. He is also a member of KU Law’s Student Bar Association, Asian Law Students Association and the intramural basketball team. The most recent addition to his resume? A clerkship with Judge Paul Gurney of the Johnson County District Court as part of the school’s Judicial Field Placement Program. 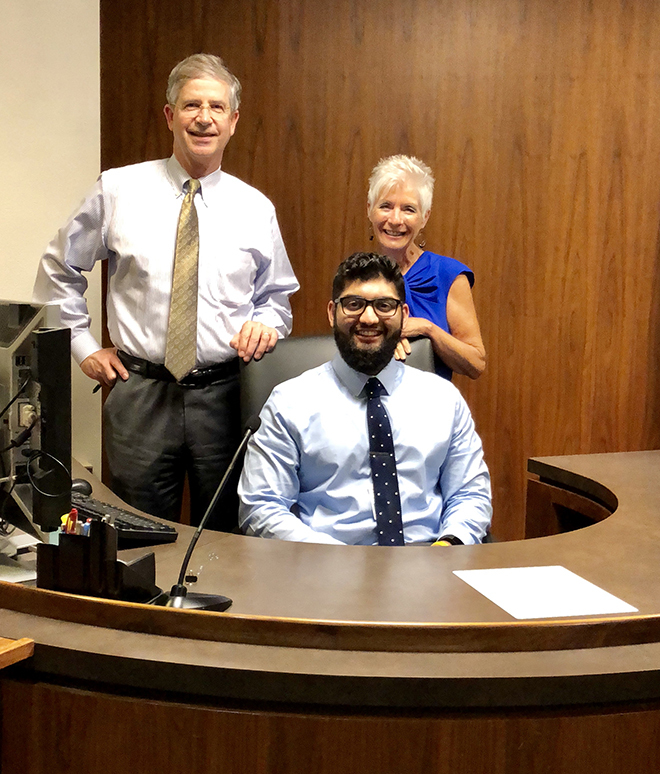 Husain, a second-year law student from Lenexa, has enjoyed getting firsthand experience of how the law works and seeing civil procedure, motions and hearings in action daily. At his field placement, Husain researches and writes memos, observes court proceedings, and reads and proofreads orders. His favorite part of the clerkship so far has been forming connections. Through Husain’s clerkship, he is gaining invaluable hands-on experience and knowledge about how court systems operate. He has also learned some valuable life lessons at his clerkship. Husain said the best piece of advice he has received is to be mindful of your reputation and to always try to make a positive impression. Husain chose to get both his undergraduate degree and his law degree from the University of Kansas. He’s a fan of KU’s rich history and the opportunities KU Law offers to students and graduates in both the Kansas City area and across the country. He hopes to combine his undergraduate degree in biology and his law degree to pursue a career in either patent law or intellectual property. This post is the first in a series highlighting the diverse internships and jobs KU Law students and recent graduates are engaged in over the summer and early in their careers. So impressed. KU Law does a great job to cultivate the students right from the outset – students with confidence, integrity, and grit to drive towards becoming great lawyers.